Most people don’t realize it, but the NFB has produced several television series over the years and has been part of the Canadian television landscape since CBFT-TV went on the air in 1952. Its most important TV series was probably The Candid Eye, now widely considered a seminal documentary series. Here is its story. In the 1950s, the National Film Board’s theatrical film audiences were in steep decline. This was offset by the great numbers of people who were tuning in every week to watch NFB productions on CBC television. First the NFB came up with the On the Spot series (1953–1955), simple 15- and 30-minute episodes of film reportage on some aspect of life in Canada. This was followed by the Perspective series, in which producers used documentary and fiction to tell a Canadian story. This series lasted for three years before the CBC pulled the plug. Perspective was an odd series; its documentary episodes were just more polished versions of the On the Spot reports. Producers at the NFB were not happy with On the Spot and considered Perspective an improvement but limited in its appeal nonetheless. Even the theatrical documentaries at that time were scripted, carefully staged and rehearsed before being filmed. There was certainly no spontaneity in what was being recorded. With the advent of portable film equipment, some filmmakers started to talk about making films unscripted and unrehearsed, to capture life as it really was. They were influenced by many sources. All over the western world, filmmakers were using this lightweight equipment to shoot from the hip and show life unfolding as it was happening. No staging. No scripts. No holds barred. It was called direct cinema, free cinema and cinema vérité, but what it amounted to was liberating filmmakers from having to plan a documentary from A to Z before shooting one foot of film. Wolf Koenig and Roman Kroitor wanted to convince producers at the NFB to let them make a film in this style and perhaps develop a series. They shot all over Montreal during the time leading to Christmas and came up with The Days Before Christmas. The CBC loved it, as did NFB producers. Six more half-hour episodes were ordered (with The Days Before Christmas to be broadcast closer to Christmas 1958). With Tom Daly as executive producer, shooting began in the spring of 1958 and continued throughout the summer. But what would they call this series? One suggestion for a title was The Roving Eye, which perfectly described the type of film being made. Someone else noted that these were candid portraits, so The Candid Eye would work better. The title stuck, even though many were worried that it might be confused with the American “comedy” series Candid Camera, in which a hidden camera filmed people who were put in ridiculously uncomfortable situations. The first episode of the new series, Blood and Fire, was broadcast on Sunday, October 26, 1958 at 5:30 p.m. to great acclaim. The film highlights the work of the Salvation Army. Accompanied by Stanley Jackson’s unobtrusive narration, it showcases, in a compact 30 minutes, the work of this religious order. A highlight of the film is the scene in which the Army’s open-air ministry is attended by many curious onlookers and a smattering of sceptical people. Reviewers loved the honest, intimate portraits of these (extra)ordinary people. The final episode was the aforementioned The Days Before Christmas, broadcast on December 7, 1958. My favourite part of the film is the department store Santa who doesn’t seem to listen to what the kids are saying before shuffling them off. As narrator Jackson says, when talking about what the Christmas experience means: “for some people, it will mean sore feet, frayed nerves and an upset stomach.” Yup, sounds like every Christmas shopping experience I have ever had. The series was a huge success, and the CBC wanted more. Production started in the spring on seven more episodes. In the meantime, the CBC asked that the NFB regroup all their current television series (The Candid Eye, Frontiers and The World in Action) under one banner. The NFB came up with the title Documentary 60 (for 1960). This new amalgamated series took over the Sunday, 5:30 p.m. timeslot in the fall of 1959. Titles produced for The Candid Eye and broadcast as part of Documentary 60 include two wonderful portraits of Canadian pianist Glenn Gould (read my earlier blog post on the films here) as well as such diverse titles as Emergency Ward, The Back-breaking Leaf, End of the Line, Festival in Puerto Rico and The Cars in Your Life. 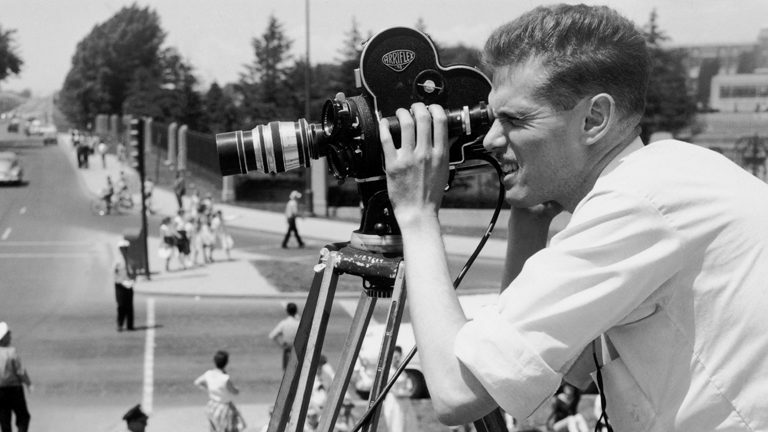 The Candid Eye was the start of something fresh and original at the NFB. It continued in the tradition of NFB films telling a true Canadian story in an innovative way. If you compare it to the On the Spot series, you can see that the documentary format of the 1950s had evolved by leaps and bounds in just a few short years, and things would never be the same again. This series was part of a global revolution in documentary filmmaking. I invite you to watch these films in which real people were the stars and everyday events were transformed into compelling stories. Badly needed – a book or long article on NFB’s work in technical innovation of Cinema Verite sound and picture equipment. Men like Ches Beechel (sp?) designed and build dubbers and recorders from scratch. Loud-mouthed Americans take all the credit but much of the early pioneering work was done in Canada. In the 1960s I worked on some amazing equipment such as perforated 1.4 inch recorders and early attempt to record sync sound before the Nagra . Watching these films is always a thrill! Shooting an event with two or three cameras allowed these creators to seize some unexpected gesture or reaction that made Candid Eye take the meaning of “keen eye”, enhancing the viewing experience, while adding another layer of emotion, whether it be humour (often wry), sadness or even pity. The editing is often extraordinary, with its frequent juxtaposition of elements, sound and image, that one would not expect but that leaves a lasting impression. Stanley Jackson might be a bit pompous at time, for example by claiming in Country Threshing that “Men will always take pleasure in the harvest” or disingenuous, particularly in pretending in Memory of Summer not to see its magic in the children, while, if you look at the images, their eyes are most often than not filled with magic. Nevertheless, Jackson’s narrations are gems: he manages to set the tone and the subject of a film in a few words and the spectator is hooked for good. Even though some of these films have aged and put forward some values unobstructed by the contemporary political correctness, they remain very important mementos of another time that still resonate strongly in 2018.
concerns immigrant children in a Montreal school being taught English by the very patient, kindly Mrs. McLeish. They come from Greece, Hong Kong, France and Morocco and they somehow manage to overcome the complexities of the English language. Children have an innate ability to learn any language to which they are exposed (cf. Chomsky, though Universal Grammar probably doesn’t exist per se). These were not exceptional children succeeding at a Herculean task. This was the developing human mind at work. Please begin your self-flagellation now.